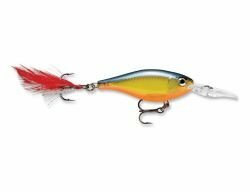 X-Rap Shad Shallow Thanks to the patented, internal Long-Casting mechanism, the X-Rap Shad Shallow is ideally suited for casting, but with its internal holographic finish and rattle system it performs equally well when trolled. When a subtle presentation is needed, use a slow, steady retrieve or a sweeping motion with the rod, allowing the lure to suspend and the Teaser Tail to work its magic between slow sweeps. Reel the slack line in while bringing the rod back to pointing to the lure to detect lazy or vary takes. For a more aggressive presentation, use a faster retrieve accented with sharp rod twitches. Remember to pause the faster retrieve every now and then and let the lure suspend for a quick moment. It?s surprising how often the fish are more likely to hit the lure when there?s even a short break in the retrieve.